Strolling through the streets of Bray, Co Wicklow, in the late afternoon after lunch yesterday [14 December 2017], it was time to relax following my visits to hospital during the week. Among the architectural delights of Bray are the fine Victorian and Edwardian suburban houses and villas just a few hundred metres from the seafront. Nearby, Toner House on Sidmonton Place is a former school for young ladies that was recently converted into a small apartment block with 13 units. The apartments are all two-bedroom units, apart from one. Toner House was built in the Venetian Gothic style, which was strongly influenced by the principles of John Ruskin (1819-1900), the leading English art critic of the Victorian era and the author of The Stones of Venice. He was a patron of the arts, a draughtsman, watercolourist, a prominent social thinker and philanthropist. He wrote on architecture, myth, ornithology, literature, education, botany, geology and political economy. Toner House stands on a prominent site at the junction of Sidmonton Place and Novara Avenue. This Ruskin-influenced, Gothic-style former terrace introduces a mildly Venetian appearance to the streetscape. Despite two changes of use this building has retained much of its original charm and character, and is now a rare example of its genre. Toner House was built in 1868 as a terrace of multiple-bay three-storey houses. The terrace was converted to a school around 1870. The house has an irregular but roughly L-plan. It is finished in red brick with straw coloured brick dressings in a style typical of Ruskin’s Venetian Gothic style. The house has a mostly redbrick exterior, bay windows and arched doorcases. The doors are recessed within Gothic arched porches. The arch to the western-most house in the terrace is set within a lean-to porch. The window openings have shallow Gothic openings with typically two-over-two timber sash flat-headed frames. At what was the eastern-most house on the terrace, there are first floor oriel windows that are supported on brackets. The hipped roof is finished with natural slate and cast-iron rainwater goods. The building is slightly set back from the pavement; the garden is now in use for car parking. 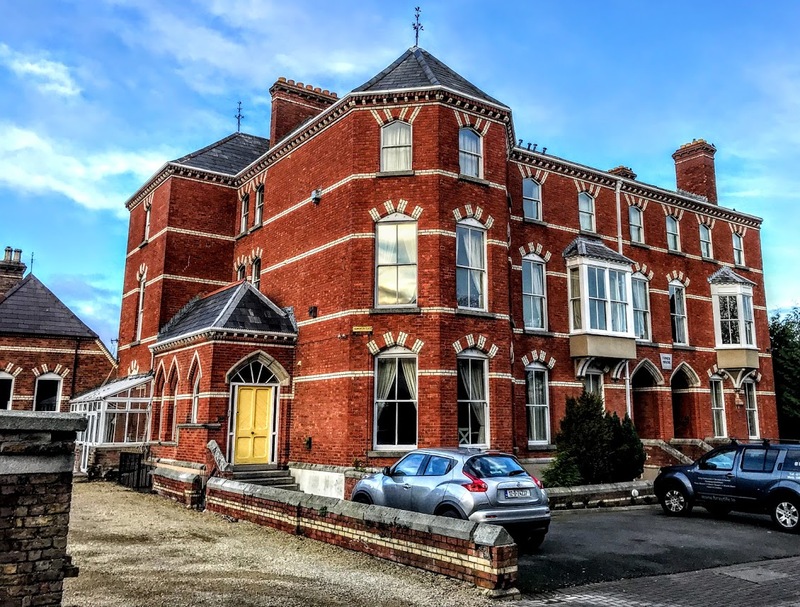 For the best part of a century, Toner House was the home of the French School for ‘young Protestant ladies.’ The French School was founded by a French aristocrat, Heloise de Mailly, in 1864, and moved into Toner House around 1870. The Suffragette Margaret Robinson was the Principal from 1927 to 1934. She was succeeded as headmistress by Elizabeth Heatley, the daughter of Robert Heatley, a prominent Bray builder, who bought the school for her. She was in charge from 1934 until 1955 and is buried in Enniskerry. The school remained open until 1966. The last headmistress is supposed to have burned all the records. A former pupil Jennifer Flegg, who later became a teacher, published a history of the school, The French School, Bray, Remembered, in 2007. The recent upgrading has included a lift to each floor, as well as well-fitted kitchens and tiled bathrooms. But many period features have been retained, including the moulded ceiling cornices, fold-away doors, marble mantels and sash windows. Some of the other nearby Victorian and Edwardian houses I admired during that afternoon stroll included Laxton House, Wellington House and Sidmonton House and Wenworth, which form an interesting pair, and the former Presbyterian Manse on Quinsborough Road, which has been renovated in recent months. But more about these tomorrow. We are coming towards the end of the second week of Advent. Throughout this season of Advent, I am spending a short time of prayer and reflection each morning, using the prayer diary of the Anglican mission agency, USPG (United Society Partners in the Gospel) and the Advent and Christmas Devotional Calendar from Lichfield Cathedral. This week, the Prayer Diary continues its Advent series, looking at how the church is reaching out to mothers and babies through ‘a USPG-supported Anglican health programme in Ghana that has helped to eradicate cholera in parts of the Cape Coast. In the Prayer Diary on Sunday, Gloria, told her story and how she had benefitted from this programme. Give thanks for the ongoing commitment to uphold the democratic system of governance that has helped to maintain peace in Ghana. Today, the calendar suggests reading Luke 7: 24-30. Think how John the Baptist appeared and what he said. Do we judge by appearances and close our minds to truth? Pray about it. Isaiah 48: 17-19; Psalm 1; and Matthew 11: 16-19.